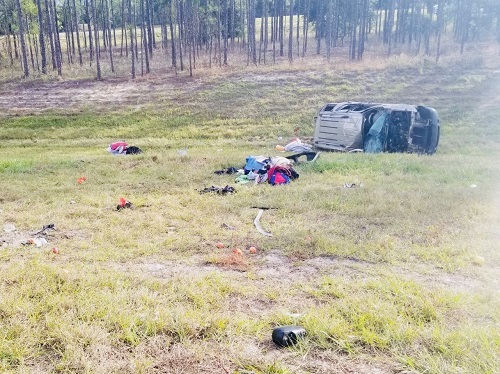 The two babies, who were not in child safety seats, were thrown out of the van when it flipped after a rear tire blew out, FHP troopers said. 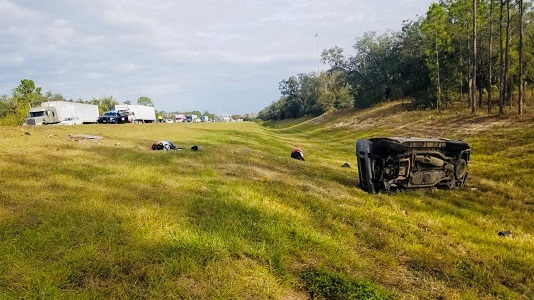 HILLSBOROUGH COUNTY – Two babies and two adults were seriously injured this morning (Dec. 13) when the van in which they were riding flipped over after a tire blew out, the Florida Highway Patrol said. Libis Juarez, 20; Marcela Pacheco, 34; Chris Martinez Santos, 1; and Marco Martinez Santos, 4 months, all of Dover, were taken to Tampa General Hospital with serious but not life-threatening injuries. The babies were not in child safety seats and the adults were not wearing seat belts, troopers said. Juarez, the driver, was cited for driving with no valid drivers license, no seat belt, and two child seat violations. The crash happened about 8:30 a..m. in the center lane of southbound I-75 near milepost 266 in Hillsborough County. Troopers said Juarez was driving a 2002 Ford when a rear tire blew out. He lost control of the van, which left the road, entered the median and overturned several times. The adults were partially ejected from the van and the children were thrown out of the vehicle.